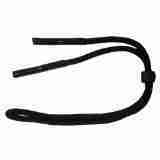 Sunglass neck strap is small thing and it costs pennies, but is worth always to have one in your pocket. I am in to photography and always used to leave my sunglasses somewhere on the ground when taking pictures. Not one was broken because of that when myself or somebody else stepped on it. It is good if that happens in populated area and it is possible to buy another sunglasses. But it can be problem in mountains where sunglasses are must to have thing. The sunglass neck strap usually fit onto all sizes of sunglasses as it’s made with a stretch to fit fabric, it is compact, lightweight and is an essential piece of your travel kit.